This is a sample from the newest development stage of the project. The entire system has been redesigned since January 2003. Order a DVD on ZGA. Flying Cars? Find out more about it here. How do flying cars work? zeroG-Autobahn is a new navigation system for flying cars. ZGA supplies traffic guidance and navigation features in a three dimensional road grid. For instance, it provides personalized devices like customized applications to change lanes or to fly curves. A personal display augments the „undesigned“ reality ahead. All required traffic information is shown on a heads-up display, which guides you safely to your final destination. Visit the zeroG-Autobahn concept of Airways and Skyways. Find out more about the design system of ZGA and all individualized navigation features. The zeroG-Autobahn project was shown at Sonar07 exhibition at the CCCB in Barcelona in 2000 and at the z2000 exhibition, Akademie der Künste in Berlin. 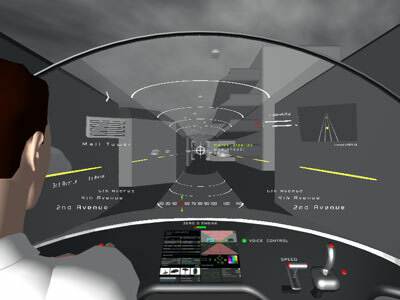 In addition, the project was published in Intersection Magazine (London) in October 2001, mentioned in technologyreview.com in 2003 and shown on the DESIGNMAI 2004, the international designfestival in Berlin. Best results with Microsoft Internet Explorer 5+ or Netscape 6+.